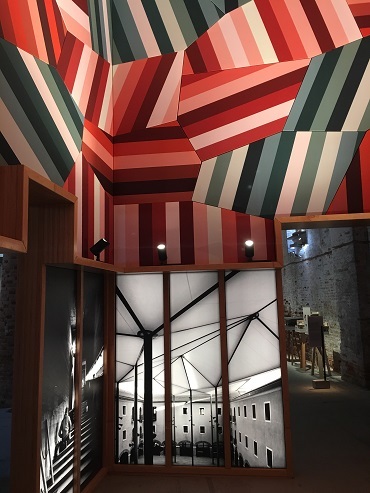 The Venice Biennale Architettura 2018 opened on the 26th of May and takes place until the 25th of November 2018. This year, all the stars aligned and I got to visit this wonderful city and the Biennale for the first time. The focus for this year’s Biennale is the question of Freespace. Freespace encourages new ways of seeing the world, and celebrates architectures capacity to provide solutions for the well-being and dignity of each citizen of this fragile planet. The curators of the Biennale, Yvonne Farrell and Shelly McNamara describe Freespace as a “generosity of spirit and a sense of humanity at the core of architecture’s agenda, focusing on the quality of space itself’. Throughout the Biennale you will find resting spots (Freespace) like this surprise at the Arsenale. Interpreting Freespace are exhibitions, displays and pavilions. With an eye for colour, trends and interior design these are the exhibits that caught my attention. The two main exhibitions are the Arsenale and the Giardini which about a 15 minute walk from each other. Tickets to these exhibitions are 30 Euros for both venues. Ticket offices are present at each of them, or you can buy online. This beautiful building is home to the Arsenale exhibition. While architecture is obviously the main focus, it was evident on many displays how colour plays such an integral part in the design process. Natural colour pigments from India, together with paint studies for various buildings. Next to the natural pigments is a stand highlighting the the M9 Museum district. This district comprises seven buildings and includes a converted 16th century convent and a 1970’s office structure which will house the history of the 20th century of Italy. Studio Anna Heringer from Germany. Anna Heringa from Germany showing the amazing craftsmanship of the women of Bangledesh. Highlighting how the clothes we wear influence spaces and lifestyles through the way they are made. Architects will enjoy this exhibition area which includes historic, restoration and new build projects. Outside the exhibition are numerous beautiful buildings that house exhibits by different countries like Russia for example. Inside is a futuristic look at architecture. Some displays grab your attention with a deliberate intention to cause a debate. The Finland display is an example of this. Called “Another generosity” This display explores the relationship between nature and the built environment, and how architecture can facilitate the creation of a world that supports the coexistence of both. The structure consists of a membrane holding two basic elements: air and water. They respond to external stimuli, creating new experiences. If you are not an architect or interior designer, there are some great exhibits to visit free of charge. Be sure not to miss this beautiful glass structure by Pae White and its painterly coloured bricks. It’s a short boat trip by taxi to the Island of San Giorgio Maggiore here you will find the Vatican Chapels scattered on an island forest. 10 international architects were invited to build chapels inspired by Skogskapellet the “woodland chapel” built in 1920 by Sweedish architect Eric Gunnar Asplund in the Cemetery of Stockholm. It was fascinating to see the diverse interpretations of the theme. I only noticed the shadow of the cross, of this chapel by architect Javier Corvalan, once I saw the photo. The beautiful woodland chapel by Norman Foster. When visiting the island, you will be stunned by the beauty of the church of San Giorgio Maggiore. This exhibition organised by the Hong Kong Insitute of Architects Biennale foundation and Hong Kong Arts Development Council, features 100 towers by 100 invited architects. Responding to the theme Freespace, the Hong Kong exhibition illustrates the compactness of Hong Kong’s urban forum and explores Freespace through towers. Hong Kong in Venice – 100 towers by 100 architects in a classic Venician setting. So good to see the importance of the environment coming through so strongly and the need for Freespace. Nothing could have prepared me for the inspiration that is the entire city of Venice and Biennale Architettura 2018. I hope this gives you a taste of what to see and that you have it on your list of things you just have to do. Your poists are all excellent, Thanks! This one on the biennale is an absolute treasure! Thank you so much Catherine, that’s so wonderful to hear.